Microcopic image of thin sections of a thoracic mouse aorta exposed to a fluorescent probe to stain telomeres. Nuclei of cells are stained blue and telomeres are shown by red dots within nuclei. The fluorescence intensity correlates with telomere length. 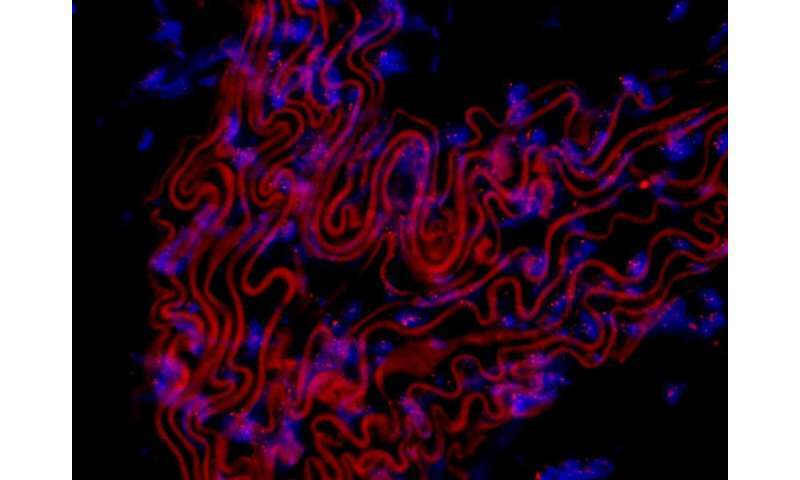 Red curved lines are from elastin auto-fluorescence. Credit: PD Dr. Christian Werner, University Clinic of the Saarland, Homburg, Germany, and the European Heart Journal. In a study published in the European Heart Journal today, researchers in Germany looked at the effects of three types of exercise—endurance training, high intensity interval training and resistance training—on the way cells in the human body age, and they found that endurance and high intensity training both slowed or even reversed cellular aging, but that resistance training did not. Prof Laufs said: "Our main finding is that, compared to the start of the study and the control group, in volunteers who did endurance and high intensity training, telomerase activity and telomere length increased, which are both important for cellular aging, regenerative capacity and thus, healthy aging. Interestingly, resistance training did not exert these effects." "The study identifies a mechanism by which endurance training—but not resistance training—improves healthy aging. 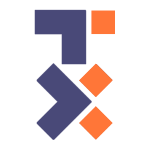 It may help to design future studies on this important topic by using telomere length as indicator of 'biological age' in future intervention studies," said Prof Laufs. Co-author of the study, Dr. Christian Werner, of Saarland University, Germany, said: "The study has several implications: Our data support the European Society of Cardiology's current guideline recommendations that resistance exercise should be complementary to endurance training rather than a substitute. 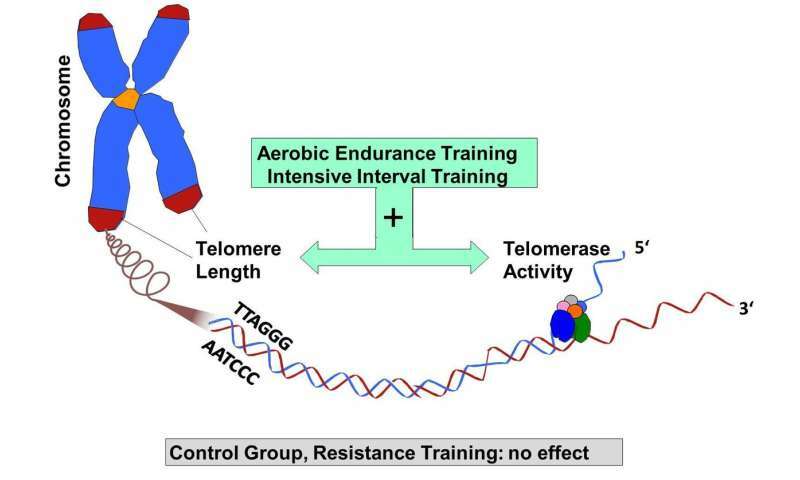 The data identify telomerase activity and telomere length as sensitive ways to measure at cell level the effects of different forms of exercise. Using these measurements to guide training recommendations for individuals may improve both adherence to and efficacy of exercise training programmes in preventing cardiovascular disease." Prof Laufs said: "Physical exercise is widely recommended. However, prospective randomised controlled training studies are very rare because they require a great effort and there are no funding sources from industry. The numbers of participants in our study may appear small compared to large drug trials, however, to the best of our knowledge, this is the largest randomised study comparing well defined training modalities with a control group and with a long duration of six months. We hope that our project will stimulate confirmation and further studies in this field." "From an evolutionary perspective, endurance and high intensity training may mimic the advantageous travelling and fight or flight behaviour of our ancestors better than strength training," said Dr. Werner. In an accompanying editorial by Professor Konstantinos Stellos and Professor Ioakim Spyridopoulos, from Newcastle University and Freeman Hospital, Newcastle Upon Tyne, UK, who were not involved in the research, write that so far there has been no evidence that the role played by telomerase to maintain telomere length is implicated in the onset of cardiovascular disease, except maybe for heart failure. Rather, it appears that an acceleration in telomere shortening may be a sign of increased oxidative stress and a higher turnover of cells, coinciding with diminished telomerase activity. However, telomerase leads to enhanced nitric oxide, decreased oxidative stress, reduced damage to cells' DNA and reduced cell death, which are all important for delaying the clogging up of arteries with fatty deposits. They conclude that the findings from the study by Dr. Werner and Prof Laufs "clearly underline the advantage of aerobic endurance training compared to resistance training in cardiovascular ageing". This is a purely none-science statement not supported or even suggested by all the experimentation done in the research. This is pure speculative myth regarding our origins. There is no way to verify this and hence it is not scientific. On me and my wife, 76 and 79 years old, this is proved with no health problems, because we are , running fast in slope or stairs each day 200m height (66 stores at least ). since 15 years. This is evident,scientifically proved, if you keep training every days, running, cycling in slopes, and swimming in summer. It is not necessary to measure telomeres,,it is sufficient to compare to our neighbors of the same age unable to run or cycle in slopes !! Look at Robert Marchand yesterday 107 years old,and cycling yesterday 20km easily in France !! OMG! I'm gonna live for ever, LOL. Or die from an overdose of telomerase. Or age backwards and die as a fetus. Remember studys only suggest. They don't prove anything. But if only runners get to live longer, it's truly a cruel world.